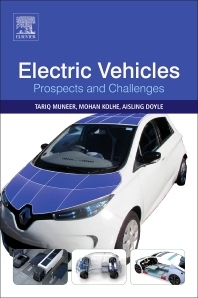 Electric Vehicles: Prospects and Challenges looks at recent design methodologies and technological advancements in electric vehicles and the integration of electric vehicles in the smart grid environment, comprehensively covering the fundamentals, theory and design, recent developments and technical issues involved with electric vehicles. Considering the prospects, challenges and policy status of specific regions and vehicle deployment, the global case study references make this book useful for academics and researchers in all engineering and sustainable transport areas. Professor Tariq Muneer, PhD, DSc, CEng, FCIBSE, Millennium Fellow is Professor of Energy Engineering at Edinburgh Napier University. He currently chairs an active group engaged in research on ‘Sustainable Energy’. He is the author of a dozen monographs some of which are: Windows in buildings, 2000, Heinemann; Heat transfer – a problem solving approach, Taylor and Francis, 2003; Solar radiation and daylight models, 2004, Elsevier; and Solar photovoltaic system applications – a guidebook for off-grid applications, Springer, 2016. He is the author of over 230 technical articles. For the past 25 years he has also chaired the Chartered Institution of Building Services Engineers (CIBSE, London) Solar Data Task Group and is the principal author of CIBSE Guides A and J. Published by Ecole de Mines (2000), Professor Muneer’s work on slope radiation was chosen for the development of the European solar radiation atlas. Professor (Dr) Mohan Kolhe is with the University of Agder (Norway) as full professor in electrical power engineering with focus in smart grid and renewable energy. He has received the offer of professorship in smart grid from the Norwegian University of Science and Technology (NTNU). He has more than twenty-five years’ academic experience at international level on electrical and renewable energy systems. He is a leading renewable energy technologist and has previously held academic positions at the world's prestigious universities e.g. University College London (UK / Australia), University of Dundee (UK); University of Jyvaskyla (Finland); and Hydrogen Research Institute, QC (Canada). He was a member of the Government of South Australia’s Renewable Energy Board (2009-2011) and worked on developing renewable energy policies. Presently he is leading the EU FP7 Smart Grid-ICT project ‘Scalable Energy Management Infrastructure for Household’ as Technical Manager. This project is in collaboration with 12 EU partners from 4 EU countries. His academic work ranges from the smart grid, grid integration of renewable energy systems, home energy management system, integrated renewable energy systems for hydrogen production, techno-economics of energy systems, solar and wind energy engineering, development of business models for distributed generation. Aisling Doyle BEng, MSc is completing her PhD at Edinburgh Napier University. Aisling attended the National University of Ireland Galway and graduated with a bachelors in Civil Engineering in 2012. In 2014 she graduated first in her class winning the class medal in Renewable Energy MSc at Edinburgh Napier University. Aisling’s work focuses on the thermal performance of the electric vehicle to be completed by October 2017. This research includes solar engineering, thermodynamics and computer modelling. Aisling won the 2016 Chartered Institute of Logistics and Transport student scholarship for her present research. Aisling is a member of the Scottish Institutes for Solar Energy Research (SISER) that brings together researchers from Glasgow, Edinburgh, Dundee and Aberdeen universities, to bring awareness and overcome barriers in the solar energy industry. Aisling works with the Transport Research Institute based in Edinburgh Napier University and is a part of a team that organised an Electric Vehicle event in Edinburgh in 2015 and 2016. Aisling’s main research interests include: electric vehicles, renewable energy and sustainable technologies.